BOOM! Studios is thrilled to announce that the first title to launch under its new BOOM! 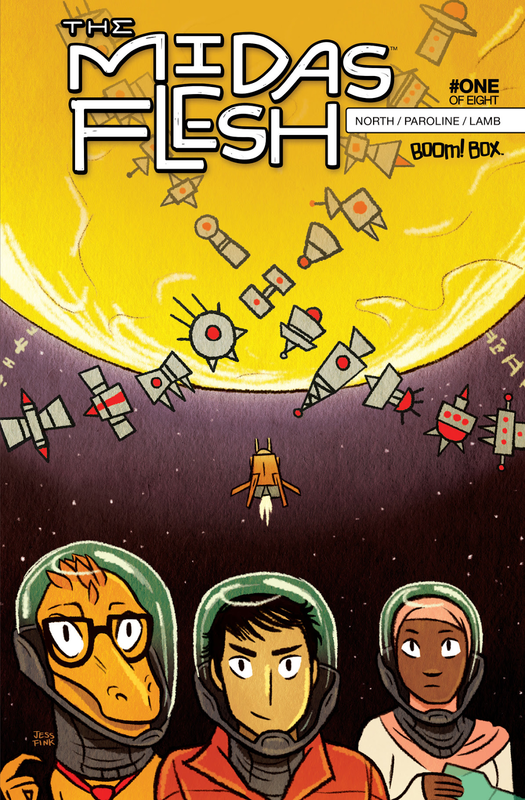 Box imprint, THE MIDAS FLESH #1 [from writer Ryan North (Dinosaur Comics) and ADVENTURE TIME artists Shelli Paroline and Braden Lamb], has sold out at the distributor level. The publisher has rushed to a second printing in support of this debut series. News of the sellout comes on the heels of last week's announcement of the second BOOM! Box series, LUMBERJANES. Comic book fans should bear in mind that first printings of THE MIDAS FLESH #1 may still be found at the local comic shop nearest you. Not sure where to find your nearest comic retailer? Use comicshoplocator.com or findacomicshop.com to find one! WHY YOU’LL LOVE IT: We’ve all heard of The Midas touch. You know, the Greek Myth about the man who did a number on himself by wishing for everything he touched to turn to gold? Who better to turn that tale on its head with a heavy dose of sci-fi than Ryan North? Also, did we mention the Utahraptor? THE MIDAS FLESH #1 second print ships with a new cover by Jess Fink and carries a retail price of $3.99 with a Diamond Code of NOV138232. It is anticipated to be in stores on February 19, 2014.